The ancient Kangly of the Kangar country occupied the steppe between Irtysh and Aral. Their ancestors are mentioned in the description of the Hunno-Chinese wars of 2nd century BC. Climatic conditions were merciless to Kangly, they occupied a super-arid zone, and consequently the droughts of the 3rd and 10th centuries seriously impacted their economy, pushing a part of Kangly on migration to other countries. Kangly played a prominent role in the history of the Middle and Central Asia, N.Pontic, and Balkans, and left a rich historical trace in the works of Islamic and western authors. 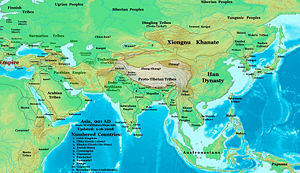 Map of Asia around the turn of the Common Era, showing the Kangly (Kangju) territory in what is now Kazakhstan. The first geographical reference to Kangly is connected with the Kangar state (Ch. Kangju), in the middle of the 1st century BC. Kangar is described as a nomadic possession 2000 li, or about 900 km from Fergana (Ch. Davan) valley. Kangar was located in the hilly East Kazakhstan steppe, between lake Balkhash and Irtysh. Kangar was separated from Middle Asia, or Turan, by the barren Bet-Pak-Dala steppe and Münkum sands. In the east Kangar adjoined the Tarbagatai Mts. West of Kangar were the Alans (Ch. Yancai) . After the conquest by the Chinese of the Western Turkic kaganate, the Chinese maps of the "Western territory" show Kangar borders: eastern at lake Alakul (46°10N 81°35E), southern at Kirgiz Ala Tau ridges (41°30N 77°00E), with the Talas river valley being a Kangar periphery, western by the Sarysu River (45°00N 66°00E), and northwestern at Lake Tengiz (50°30N 69°00E), where Kangar bordered with the Uigurs (Ch. Ui-Bei-Go - Northern Ui). Hanshu "History of Former Han dynasty" mentions that Kangar had five smaller vassal possessions, shown on the map along the northern bank of the Chu river along a distance of about 500 km, exactly the length of Chu from Chuili ridge to Syr-Darya, near Kzyl-Orda. These small princedoms separated Kangar from Sogdiana, Persia and Greco-Bactria, and later the Kushan Empire. Kangly also bordered the Parthian Empire directly, on the left bank of Syr-Darya below Kzyl-Orda lie the ruins of ancient cities, and Strabo mentioned on the east coast of Aral sea Dahae, a main Parthian tribe. But the character of connections between Kangar and Parthia is unknown . On the Ptolemy map, Kangly are called Alanorses. The Kangar "empire" was a confederation of principalities each ruled by their princes, who recognized a suzerainity of the supreme ruler while retaining enough independence . The "History of Former Han dynasty" (111 CE) also says that Kangly's western neighbor (Yantsai) was independent from Kangly, while the "History of Later Han dynasty" (5th c. CE) says that Yantsai and its northern neighbor Yan are vassals of Kangar, which apparently subjugated them in the 1st - 2nd centuries AD. Kangly are not thought to have crossed the Itil. In the middle of the 1st century BC, Kangly's population was estimated at a significant 600 thousand, with a field army at 120 thousand (considerable numbers for those times, almost as many as the Persians during Cyrus epoch, and only twice less than contemporary Greeks. Kangar state circumference was given in "Hanshu" as 3,600 km . Early in their history, the Kangly were bitter rivals with the Usun (Wusun, Issedones). Kangly's relations with China were usually hostile, as Kangar influence paralyzed the Chinese influence in Fergana. Wusun's submission to China lead to a Kangar military intervention, which a divided and disorganized Wusun could not resist. However Kangly also could not crush Wusun without assistance, and allied with the Huns. The Wusun, in response, recognized the Chinese protectorate and completely broke off with the Huns. During trouble times in 59 BCE, a Hunnish provincial prince (Ch. jichjo) submitted to China, the Chinese occupied the northern caravan road to Yarkand, and founded there a new commandery that was also to monitor Kangar and Wusun. Kangar, located in steppes between Aral sea and Balkhash, had remained a Hun ally, and was in a war with the Usun. The expansion of the Oguz Yabgu state, and the Kimak Kaganate, pushed Kangly to the west. In 840 the western branch of Kangly, called in the Arabic sources Bajanaks, defeated a Magyar 7-tribe confederation, who fled west, led by the Onugur Bulgar Arpad of possibly of Dulo lineage, first to Atilkuzu area through which flow five big rivers Dnieper, Boh, Dniester, Prut and Seret. Three years later, Bajanaks advanced again and as allies of Danube Bulgaria Tzar Shamgun (aka Simeon I) they forced Magyar confederation to flee further west. Bajanaks took possession of the N.Pontic, over which they ruled for over 150 years. Approximate borders of their western realm were Don river in the east and Danube in the west. Ibn Fadlan, travelling in the 922 with a Caliphate embassy to the Bulgaia, crossed from the Khwarezm Oguz lands into the eastern Bajanak territory in the interfluvial between the Itil, Yaik and Emba rivers. Ibn Fadlan left notes describing unruliness and poverty of the eastern Bajanaks. In the early 9th century Bajanaks bordered Khazar Kaganate and Itil Bulgaria from the east. Constantine Porphyrogenitus (905–959) and Anna Comnenus (1083–1153) left listings of the Kangar and Bajanak clans, some of their territories, and seven Bajanak cities. The Kangar clans were Ertim, Chor (Turkic "Princely"), Yula (Turkic "Road"), Iabdierti and Kouartzitzour, and Khabuksigyla. The Bajanak clans were Kukhey, Karabai (Turkic "Black/Western Prince"), Tolmach (Turkic "Translator"), Kapan (Turkic title "Kapgan"), Choban (Turkic "shepherd"), Syroukalpei and Karabai, Borotalmat, and Giazichopon (Giazi zopan), and Bou[i]latzopon (Bulat zopan, i.e. Turkic "Sword Zopan"), Paguman and Belermen. Anna Comnenus noted that Badjanak language is the same as Kuman Khans Bonyak and Tugor language. The fact that Anna Comnenus emphasized a linguistic unity, and not a similarity of the languages, though the Badjanak and Kipchak languages belong to different linguistic groups, indicates that Kumans may have spoken the Badjanak language because a mass of the Badjanak-Oguz population joined the Kipchak western hordes. In the beginning of the 11th century the N.Pontic steppes were taken by Sharys, the "yellow" Kipchaks. They became a powerful nucleus, around which were united remains of Badjanaks, Oguzes, and partially the remains of the Bulgarian and Alanian populations. In the 1090es under a pressure of Kipchaks the Badjanaks retreated to the Balkans. Badjanaks moved on the main territory of the Byzantine empire. Alexius I Comnenus (1081-1118) turned for help to Kipchaks, who came to the Byzantine help under leadership of Khan Bonyak and Khan Tugor. A battle ended with a full defeat of Badjanaks, and during the night after the battle Byzantines savagely slaughtered 30 thousand captured (mostly women and children). Startled by the wild cruelty of that night, Kipchaks took their share, left their allies, and quickly returned to the Danube. For the Kangly people, the war ended with a national catastrophe . From 1207, Mongols began occupying more tribes of northern Siberia. After 5 years struggle with Alans, Bulgars and other Turkic tribes of the Kypchak steppes, massive army of Mongol empire launched invasion to subjugate those people. By 1241, most of the Eastern European Turkic, indo-European, and Finnish tribes had become Mongolian Great Khan's subjects. Verbal description of one of the Kangly tribe tamgas, who lived in antiquity together with Kypchaks, was a Kypchak "pole" tamga next to the image of a full moon with beams of rays. Kangar battle cry (uran) was bai-terek (Turkic "sacred tree") . A graphical depiction of the Kangar (called Kan-he-li < Kangarlyg by the source) tamga comes from the 8-10th centuries report in the Chinese composition "Tanghuyao" . Modern Kangly subdivision in the Senior Juz in Kazakhstan have tamga "I" called koseu and identical to the general Kypchak tamga, and a second thunderbolt-shaped tamga called shylbyr, and the ancient uran battle cry "bai-terek" . Another burial type was Kangar's "T-type" kurgan catacombs in the basin of Syr-darya, a type that was noted as one of a number of common material culture peculiarities between the Kangar, a "largest nomadic empire in Turkrstan", and N.Caucasus Alans . Well-known monuments in the areas of Dnieper, Don, Kuban, and Volga rivers, associated with the ancient Alans, display specific elements of eastern archeological cultures, extending from Kangar to the territories of Mongolia and China . Gumilev L.N., "History of Hun People", Moscow, 'Science', (In Russian) Ch.11. ^ Constantine Porphyrogenitus, "De Administrando Imperio"
^ Gabuev T.A. "Localization of "small" possessions of Kangüi"
This page was last modified on 9 July 2008, at 21:11.